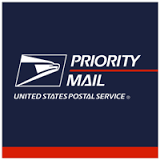 Save time and money with USPS Priority Mail shipping. Get your hexayurt tape package in two or three days for about the same price as UPS ground. Click here to see select packages that are Priority Mail eligible.